This painting shows off the spontaneous agility of the acrobat's body. Pablo Picasso is the initiator of biomorphism, which is pioneered by fellow Spaniard Joan Miro. But Miro goes further by using neo-Neolithic shapes to define new spatial concepts of freedom and rejected Cubist space. 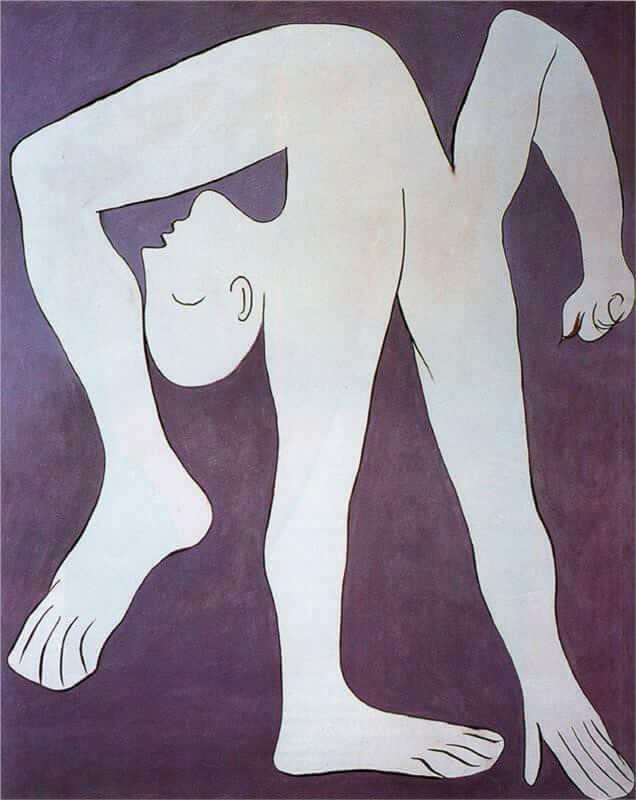 But on the other hand, Picasso's exploration with surrealism maintained the human form and identity. In this painting, The Acrobat, Picasso depicted the human figure with the cube of the frame despite the apparent freedom of movement. The figure is also maintained by the colors, which controls the motion of the body. It seems the body shaope is locked within a white form and then pinioned against the implied stasis of the black background. This painting is a good proof of the paradox of movement and rigidity. This figure seems like a male but we cannot be sure since in that period there are so many works are disfigurations of the female form. Since most of Surrealist works contain some sexual reference or punning, so it's possible this weird, dangling phallic hand is similar to the pendulous penile limb formations of painting Woman in an Armchair (1929).